Home » WHO BUILT THE GREAT PYRAMID? Egyptologists would have us believe that the Great Pyramid and its two sister pyramids were built in the early dynastic period of the Old Kingdom, about 4,600 years ago. Looking at the evidence objectively, however, their case is far from clear cut. 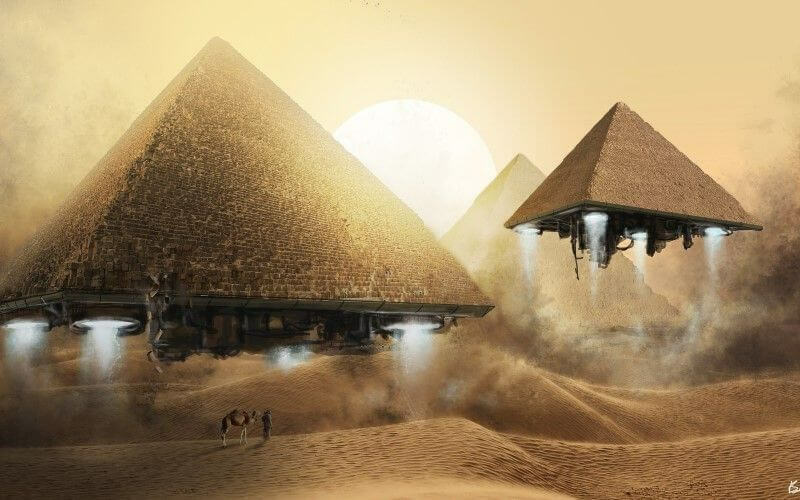 In his book ‘The Phoenix Solution’ (1998), Alan Alsford claimed that much of the evidence for the 4th dynasty origin of the Giza Pyramids and Sphinx actually pointed to an adoption scenario, rather than construction of the monuments during that time period. Thus, according to this theory, the Egyptian pharaohs Khufu and Khafre adopted the Great Pyramid, the Second Pyramid and the Sphinx, rather than built them. In addition to renovating these structures, they and their successors built the causeways which ran between the mortuary and valley temples, and the smaller pyramids and masteba. According to Alsford, this massive building program would explain the presence of the early dynastic workers’ villages which have recently been excavated at Giza. The most solid piece of evidence supporting the premise that the Great Pyramid, and by inference the other Giza monuments, originated in the 4th dynasty is the ‘workmen’s graffiti’. This graffiti was discovered by an English adventurer, Colonel Howard Vyse in 1837. It was found inside sealed chambers (the ‘relieving chambers’ above the King’s Chamber) and contained references to Khufu. Thus, on this basis, it was concluded that Khufu had indeed built the pyramid. The authenticity of the workmen’s graffiti in the Great Pyramid is questionable. Alsford and many other authors claim that the graffiti could have been faked. It was known at the time that Colonel Vyse had expended many years and a great deal of money on expeditions to Egypt, but had failed to unearth anything of major significance until his ‘amazing’ discovery in the Great Pyramid. The Graffiti could have easily been fabricated by copying inscriptions which had already been discovered on other structures and in the quarries nearby. Interestingly, the graffiti was only found in the chambers broken into by the Colonel. The so called Davidson chamber, lying below the other chambers and discovered by an earlier explorer, had no such graffiti. Indeed the rest of the pyramid is strangely devoid of markings of any kind. In the absence of any attempt to radiocarbon date the ‘red ochre’ paint which was used to daub the graffiti onto the massive granite blocks in the relieving chambers, debate as to the authenticity of the graffiti will continue. The Inventory Stele, found in 1857 by Auguste Mariette to the east of the Great Pyramid, dates to about 1500 B.C. According to Maspero and other experts, however, it shows evidence of having been copied from a far older stele originating in the 4th Dynasty. In this Stele, the pharaoh Khufu speaks of his discoveries made while clearing away the sands from the Great Pyramid and Sphinx. He dedicated the account to Isis, who he called the ‘Mistress of the Western Mountain’, and the ‘Mistress of the Pyramid’, and identified the Great Pyramid itself as the ‘House of Isis’. The Stele describes how Khufu, ‘gave to her (Isis) an offering anew, and built again (to restore or renovate) her temple of stone’. According to the text, the Pharaoh inspected the Sphinx and found that the monument and a nearby sycamore tree had been struck by lightning. The lightening strike had knocked off part of the headdress of the Sphinx, which Khufu restored. Egyptologist Selim Hassan, who dug the Sphinx out from the surrounding sands in the 1930’s, observed there was indeed evidence that portions of the Sphinx were damaged by lightning, and the location of the ancient repairs was clearly visible. He also discovered that sycamore trees once grew to the south of the monument. The Stele finishes with the story of how Khufu built small pyramids for himself, his wife, daughters and other family members, next to the Great Pyramid. Today, the ruins of three small pyramids are indeed situated on the eastern side of the monument. Archaeologists have found independent evidence that the southernmost of the three small pyramids, flanking the Great Pyramid, was dedicated to Henutsen, a wife of Khufu. 4th dynasty inscriptions found at Giza also confirm that Khufu was building mastaba fields for his senior officials to the west of the Great Pyramid in the fifth year of his reign. Given the time frame and huge resources necessary for the construction of the Great Pyramid, it would appear highly unlikely that he would have diverted significant manpower and materials from the building of his own ‘tomb’ to build these masteba and smaller pyramids. The inscriptions make a great deal more sense if the Great Pyramid was already in existence. The 1983-84 ‘Pyramids Carbon-dating Project’, directed by Mark Lehner and Robert Wenke, delivered results that do not support the building of these structures during the 4th dynasty. For example, thirteen samples of mortar taken from the Great Pyramid gave construction dates in the range 3101-2853 B.C., and an average date of around 3000 B.C. Similarly, samples of mortar removed from the Second Pyramid produced a comparable date. It is interesting to note that all of these samples were taken from stone courses on the outside of the pyramids. As such, using these samples to date the structure is questionable. The mortar samples could have had a much later origin than the massive stone blocks from which they were taken, as part of a restoration project; much better to have taken the samples from deeper into the stone work. Such was the confusion caused by the carbon-dating project that a second study was carried out in 1995. The results of this study were published in 2001. In the case of the Great Pyramid there was still considerable scatter in the data over a range of about 400 years. In September 1872 a British engineer, Waynman Dixon, discovered the openings of two shafts on the south and north walls of the Queen’s Chamber. In the horizontal section of the shafts that lead into the chamber he found three small relics; a granite ball, a small bronze hook and piece of ‘cedar-like’ wood. The relics were taken to England. Unfortunately, the small piece of wood went missing, and thus no carbon-14 dating of the relic was possible. A German Engineer, Rudolf Gantenbrink, explored the shafts of the Queen’s Chamber in the Great Pyramid in 1993 using a miniature robot fitted with a video camera. He discovered a long wooden rod whose shape and general appearance seemed identical to that of the shorter piece found by the Dixons in 1872 at the bottom of this shaft. The wood could, of course, be carbon-14 dated and provide further insight as to the age of the Great Pyramid. So far the wooden rod has not been retrieved by Dr. Zahi Hawass, the Director-General of the Giza monuments, in spite of the many requests for him to do so. Geologist Robert Schoch and others have demonstrated that the granite casing blocks of the Valley Temple, close to the Great Pyramid, are fitted to limestone blocks which had already been severely weathered. Since the casing blocks have been dated to the 4th dynasty, the inner limestone core, i.e. the original temple blocks, must date to long before the 4th dynasty. Such being the case, it then becomes highly likely that the other megalithic temples at Giza, which are credited to Khufu and Khafre, were also originally constructed long before the 4th dynasty. As some of the enormous blocks of stone are known to have been quarried from the limestone of the Sphinx enclosure, this would date the temples to the period when the Sphinx was carved. From an extensive study of the highly-weathered limestone rock of the Sphinx, and the enclosure in which it is situated, Robert Schoch concluded that the monument was exposed to prolonged heavy rainfall, and he has therefore dated its construction to a much earlier period than the 4th dynasty of the Egyptian Old Kingdom. If the Sphinx is indeed far older than orthodox Egyptologists would have us believe, it calls into doubt the dating of the other monuments at Giza. Returning to the Inventory Stele, there is mention of Khufu repairing the Sphinx rather than building it. If it is accepted that the Inventory Stele is a genuine copy of an earlier document, and not a fake, this would undermine the belief that Khufu’s son Khafre built the Sphinx. Thus, the evidence from geology and the Inventory Stele, together, support the view that the Sphinx is far older than the 4th Dynasty. Many Egyptian, Greek, Roman, Hebrew, Hermetic, Coptic and medieval Arabic scholarly sources agree that the Great Pyramid was not constructed during the time frame of Pharaoh Khufu or The Old Kingdom, but was built during the ‘Age of the Gods’ thousands of years earlier. Time and again ancient legends, recorded for example by the Roman Marcellinus, the Coptic Al Masudi and the Arab Ibn Abd Alhokim, recount how the Great Pyramid was built to preserve the knowledge of a magnificent civilization from destruction by a flood; a flood that brought the Age of the Gods to an abrupt end. The various Chronologies of Legendary Rulers place a minimum date for the end of the Age of the Gods at around 10,000 B.C. This is the time frame ascribed to the destruction of Atlantis, in the literary works of Plato. It is now known that this was a period of enormous climatic and geological upheaval, accompanied by massive plant and animal extinctions. It was the time of the ending of the last Ice Age. In Egypt, geologists have found that the combined effects of melting glaciers coupled with a steep rise in precipitation levels in Central Africa, around 10,000 B.C., caused the Nile River to swell hugely in size washing out its entire valley throughout the length of Egypt. At the same time, the Mediterranean Sea began to expand due to rising ocean levels from the meltdown of the northern glaciers. It has been established that for a brief period its waters actually flooded the lower Nile Valley. These inundations are believed by geologists to have been the last major flood events in Egypt’s history. Consistent with this, a fourteen-foot layer of sediment was discovered around the base of the Great Pyramid. It was found to contain many seashells, and the fossil of a sea cow, all of which were radiocarbon dated to about 10,000 B.C. Legends and records also relate that, before the Arabs removed the Great Pyramid’s outer casing stones, water marks were visible at around the 240 foot level. When the Pyramid was first opened in relatively modern times, incrustations of salt an inch thick were found inside. Most of this salt was revealed to be natural exudation from the rock walls, but chemical analysis also indicated that a proportion of the salt had a mineral content consistent with sea salt. By analogy, if the flooding of 10,000 B.C. was the last major inundation of Egypt, the Great Pyramid must date from a period before the flooding occurred. Looking at the evidence overall, the case for a 4th Dynasty origin for the Giza monuments is surprisingly weak. Who in fact built the pyramids at Giza, how old they really are, and what they were originally used for, still remains a mystery – except perhaps for a chosen few.